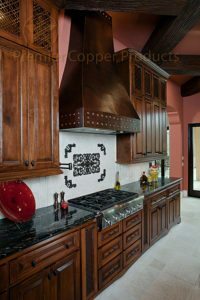 Premier Copper Products’ skilled artisans have the ability to create the copper range hood of your dreams! 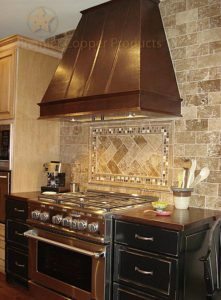 We stock several models of kitchen range hoods based off of the most common kitchen cabinet and ceiling dimensions, however, the majority of our hammered copper range hoods are made custom for your kitchen. Premier Copper Products also offers a wide variety of inserts/fans to meet your building code/cook-top power requirements. Currently in the market for other hammered copper home products? Check out our extensive line of hammered copper bathtubs, sinks, tiles, mirror frames, vanities, pendant lights, and more!